This class will look for hornetq-configuration.xml, hornetq-jms.xml, and hornetq-users.xml within your classpath. It also has the option of manually creating configuration objects via pojo instantiation if you desire (or if you want to wire it with Spring for instance). Another thing I did was to provide some simple Spring integration with the HornetQ JMS implementation. I wrote a simple class that extends EmbeddedJMS that will register any configured queues, topics, and ConnectionFactorys direction within the Spring application context so that other beans can reference them. Here’s an example of bootstrapping HornetQ JMS and referencing a queue within a Spring message listener container. Again, this assumes you have configured HornetQ properly within HornetQ specific configuration files. You can also manually declare HornetQ config objects within Spring and inject them into the EmbeddedJMS bean instance too if you don’t want to use HornetQ config files. Right now, the code does not also register HornetQ objects within JNDI. Do you think I should add this capability? Anyways, I hope you’ll find this HornetQ + Spring integration useful in the next HornetQ release. Awhile back on TSS, I complained about OSGi possibly bleeding too much into applications. That OSGi did not belong within application code. This IBM article is a prime example of my point. Here we have standard Spring code and XML. Nowhere in there do you have OSGi APIs. Yet, you get OSGi classloading and lifecycle. I bet, that if you can’t already right now, Spring will eventually be able to register IoC references as direct dependencies within an OSGi kernel. There’s really no reason or advantage to have OSGi APIs bleed into application code. Another example is JBoss 5. While not running on top of an OSGi kernel (instead its running on JBoss’s own special kernel) it can manage dependency and lifecycle for a variety of different component models like: Spring, JBoss MC, EJBs, JCA adapters, Queues, Topics, Servlets, etc. This can work because JBoss’s kernel provides a deployment abstraction and framework to publish and manage inter-component dependencies. The end goal here is that all these different component models can take advantage of all this dependency management without writing to specific APIs and to stay within the confines of their own component model’s specification. The metadata is there. The dependency information is there. There’s no reason to write to a specific deployment API to leverage these types of services. This is what I had hoped OSGi would become. A standard kernel where classloading, deployment, and dependency management would be provided as low level services so that existing and new component models would have a standard way to mix and match themselves and to deploy themselves. In theory, such a kernel would allow JBoss’s Transaction Manager to run within a Web Logic server. JBoss’s EJB container to run within Websphere. Sun’s WS-* implementation to run within JBoss. Maybe my concern is not real. Maybe most OSGi evangelists are not positioning OSGi as an application API. Let’s hope they aren’t. Seems Rod isn’t immune to the typical startup hunger for cash. They raised another $15 million today. To put things into perspective, Jboss raised $10 million in 2004. When we got acquired in 2006 we had only burned through 5-6 million and that was after the Arjuna acquisition, building a new 2 floor office, and adding 150 people to the payroll. I’ve been at startups that burned through 10 million in 6 months then went out of business. I hope this is good news rather than bad news for the SS. Even though I do trash them every once in awhile, every professional open source success is good for the industry and inches the industry closer to an open source model. Over 3 years EJB jobs have remained pretty much constant. This is very encouraging news considering recent Rod Johnson propaganda. EJB really did not have an alternative in the Java space until 2004/2005 when Spring started to be known and popular. It is very interesting to see that although EJB has had a serious competitor, it has maintained its dominance in Java application development over the years. You could even extrapolate from these numbers that EJB is an upper bound on the number of Java component jobs out there and that Spring has only recently matched this. 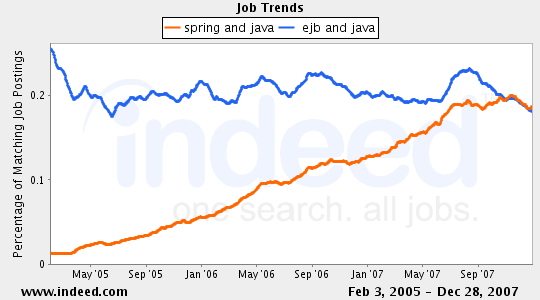 This is proven by the fact that the Spring and Java graph trends are the same since they converged 6 months ago. This trend pretty much correlates with download numbers I posted on our EJB implementation awhile back on TSS in June 2007. Now that’s just JBoss. You also have Glassfish, Open JPA, Oracle, and now Geronimo communities not included in these numbers. Also, my EJB 3.0 book has been out a year and has sold ~12K copies +/- a thousand (haven’t gotten check yet from last quarter). So, all and all I think there is pretty compelling evidence that EJB3 and JPA has momentum. Its hard to continue any analysis on JBoss specific download numbers as we basically encourage our user base to download JBoss 4.2.x or 5 as it is bundled with our EJB3 implementation. There’s some other encouraging numbers as well. In 2005 I was offered by O’Reilly to take over Richard Monson-Haefel’s EJB series. “EJB 3.0, 5th Edition” was published in May, 2006. Even after being out for almost a year and half, sales are still going strong. Just last quarter we sold 1700 copies, very good for a technical book. When I went to Krakow in October, I also found that my book had been translated into Polish. I believe its also been published in Chinese. All indicators of broad adoption by the technology. So, as you can see, even after almost 10 years, EJB is still going strong and maintaining its dominance. With the emergence of Seam and Web Beans being incorporated into EE 6, I predict this trend to continue. Back in 2004 JBoss had a tough decision to make. Should we keep Hibernate proprietary and under our sole control? Or should we bring it to a standards body? You know the decision we made. I think Spring and Interface 21 are at a similar crossroads, whether they know it or not. I’d like to call on Interface 21 to bring core Spring IoC to EE 6. Here’s why its a win-win situation for everybody. I personally think that the main reason I21 hasn’t thought about standardizing Spring is because they are worried it will hurt their business. We had the exact similar fear with Hibernate. What would happen if we standardized Hibernate and gave the opportunity to vendors like Oracle and BEA to enter the ORM space and threaten our growing strangle hold on ORM frameworks? The reality of the situation was that there was a shrinking, but still very large, set of users out there still using CMP. Many of these organizations were married to standards and wouldn’t go proprietary, even though Hibernate was open source. What ended up happening was that when we brought Hibernate to the EJB 3.0 and JPA specification, Hibernate was recognized immediately as a migration path to EE 5. Hibernate downloads skyrocketed along with Hibernate related business. I just know that Spring and Interface 21 would notice similar gains if they aligned with EE 6. The Spring community will probably scoff at any suggestion that the EJB user base is still large enough to make any impact on things, but this is just not the case. Yes, Spring has a large community, but EE 5 stopped much of the bleeding and breathed new life into the EJB specification. I know this because I’ve been out there. There’s also these compelling facts about EJB 3 momentum that I posted on a TSS thread back in June. Let’s face it, Spring is not a kernel. It has no deployment model. It is dependent on bootstrapping itself through the WAR init process, manually, or by proprietary app server specific init classes. It has no classloader scoping, delegating it to the application server it is running in. The Spring guys know this is a weakness of theirs, which is why they are so keen to align themselves with OSGi. They desperately need a standardized kernel to build their own stack. If Spring was brought to EE 6, they would get this deployment model they so thirst for. Not only this, but it would be even easier, more consistent, and simpler to package and deploy Spring components within other application servers like what we do with the JBoss Spring Deployer. The Spring community would also get the benefit of mixing and matching Spring technology with EE component models. Although EE 5 added some IoC capabilities, its still both verbose and incomplete. For instance, you cannot define graphs of pojos within XML and inject it into an EE components. This limits EE to having to solely work with primitives when doing configuration. Not very flexible. Beyond technical reasons, having Spring standardized would make EE 6 a compelling platform to migrate to just like annotations and Hibernate standardization made EE 5 exciting. Bringing the weight of the Spring community into EE would greatly strengthen and unify the Java enterprise space. Before EE 5, you had division in the Java ORM world. You had the CMP crowd: big, but legacy. The JDO crowd: noisy, but irrelevant. And the Hibernate crowd: large, de facto, but proprietary. What JPA did was get everybody together and start showing a unified path and vision for the Java ORM space. I think Spring and EJB are in a very similar situation and we would get similar benefit of joining them. So Rod, Bill Shannon this is good for everybody, so lets get it done.